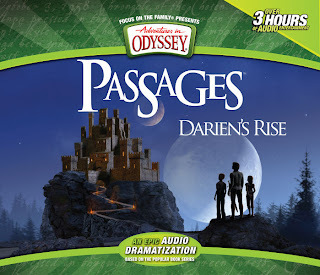 The topic at hand for this episode is the special edition Adventures in Odyssey episodes entitled Passages: Darien's Rise, adapted from the book by Paul McCusker. We discuss this great audio drama production and go over its high and low points. Roy delivers a splendid newscast, we share some listener feedback, and we also feature a "micro-drama" which was produced by Austin Peachey of the AIO Blog. Download episode 1 of Darien's Rise for free! Austin Peachey's one scene audio drama, "An Odyssey Date Night".